We are so excited to share another guest review! This one is from our good friend, Beth Lacey. We hope you enjoy this review as much as we did! Thanks Beth! And I love when the sugar is baked into a perfect little round cake topped with more creamed sugary goodness. (You do too, don’t you?!) Mmmm. So I opted to dedicate a bit of my recent vacation to the Outer Banks, N.C., to the cupcake crusade! I tested two places in Duck (a small borough north of the more-touristy Nags Head area). It’s a really delightful little barrier island, close to the beach and very walkable. The first place I tested, Tulio’s Bakery, is a tried and true bakery, and they don’t specialize in cupcakes. But they were runner up in making my parents’ wedding cake and have a long history in the Outer Banks. They’ve been there well since before I can remember, and I can still recall a few of their delights as a kid. 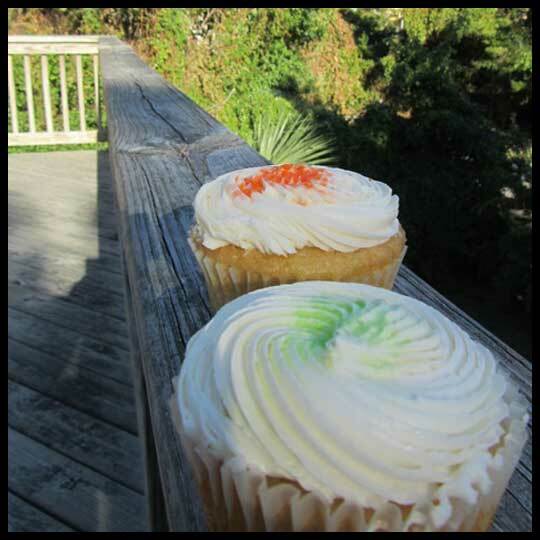 When I visited, just days after Hurricane Irene swept through, I was surprised to find six kinds of cupcakes, and all of them looked simple and pretty. I selected two summery flavors that set my sweet tooth a pinging: orange creamsicle and key lime. Unfortunately, nothing about these cupcakes lived up to the Tulio name. 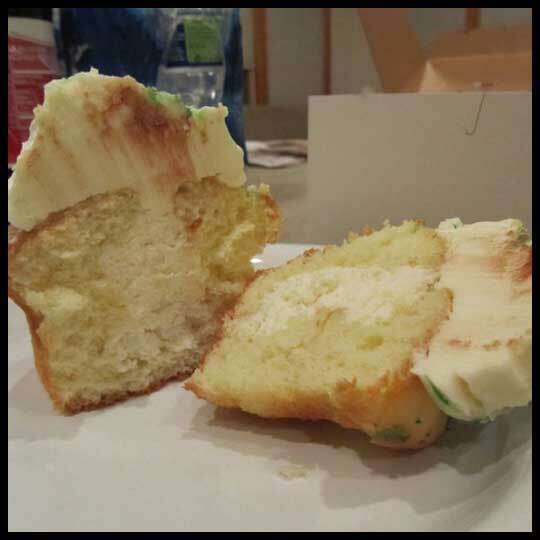 The two cupcakes were unevenly sized (the key lime being much smaller), and both were so dry that I clamored for more icing. But the icing couldn’t save these cupcakes either — the creamsicle whip was gritty, as if the sugar hadn’t totally melted. At $3.95 a piece, I was nothing but disappointed. In a search of a worthwhile cupcake, I came across the Sweet Duck, a brand new addition to Scarborough Faire (a cluster of locally owned shops in a darling forested area just steps from the Albemarle Sound). The Sweet Duck is owned by the chef of Argyles Restaurant in Kitty Hawk, and it focuses on all things sweet (from root beer to chocolate wine to mango gelato to a whole range of desserts). The Sweet Duck had four flavors when I visited, and I selected white chocolate key lime and eclair. Both were divine from start to finish. I loved the red tissue paper used in place of plain wrappers, and the moist cake — hand filled with white chocolate or custard respectively — was just right for the proportion of smooth, delicious frosting. Plus, the key lime was clearly made with real key limes (not regular limes, which makes the flavor too tart, a mistake that Tulio’s had made). On my next visit to Duck (or yours?! ), I’m looking forward to returning to Barr-ee Station, which had a great photo of cupcakes, but were not selling them because of the flooding in the baker’s area. I’ve heard good things, and the owner was just lovely. If their sugary gems are anything like The Sweet Duck’s, I’m sure my obvious sweet tooth will love them! – Review by Guest Crusader, Beth Lacey (Baltimore, MD). If you like her review, check out her blog on music and life. She’s fantastic! 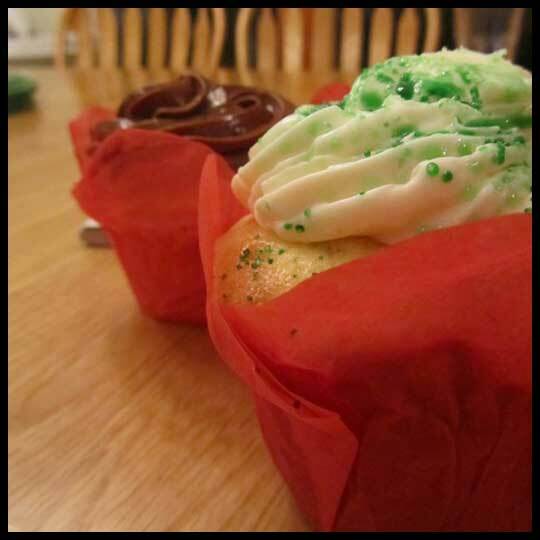 This entry was posted in Cupcakes, North Carolina and tagged Outer Banks, Sweet Duck, Tulio's Bakery by Stacy. Bookmark the permalink. Argyles is a great place to have dinner too. I’m not surprised their chef can make a good cupcake. There is a pretty impressive display of wedding cakes in the restaurant. The entire restaurant has the most tacky looking decor, but the food is outstanding. Definitely a must. Thanks for the Feedback Bri! That’s really great to know! Thanks for your review, Beth! I love your observation of key lime vs. regular lime. I don’t think many people would notice the difference (like myself) having not experienced enough REAL key lime. Sweet Duck’s sounds like a little piece of heaven, and not just because of their cupcakes! I know where I’ll be heading next summer! Love it, ladies! Yummy! Now I want cupcakes again. Oh wow, I just got back from Duck two weeks ago and was searching for a good cupcake! What a small world! I think I was in the same place you mentioned, Barr-ee-Station, too. Kind a cute clothing boutique but has a cupcake on their sign out front? I stopped in twice to see if the cupcakes were available and heard about the baker’s flooding situation 😦 If we go back next year, I’ll be sure to look for Sweet Duck. Glad you found a winner! I love OBX. I have been visiting Cape Hatteras and Ocracoke once a year for the last three years because I’m hooked. Next time I go I will try to make a stop at The Sweet Duck for sure.